For the third annual “Student to Student Mentoring” program, mentors from James Caldwell High School were paired up with students from Washington Elementary School. This year, the program promotes literacy within the district by pairing 21 special education high school students with 28 special education elementary students for a letter writing campaign and a shared interest in reading. In addition to this year’s new literacy theme, the program was steered in a fun creative direction. Sponsored by the Caldwell-West Caldwell Education Foundation, the program’s expansion allowed the student mentors to write children’s books that were later illustrated by students enrolled in the James Caldwell High School’s computer graphics classes. The classes were led by art teacher, Mea Amacher with support from resident artist, writer and illustrator, Irene Kelly. An Artist -in-Education (AIE) grant funded the book project and was secured by Robin Keil, the program’s advisor and special education teacher and Amacher. The AIE program is carried out through a partnership between the New Jersey State Council on the Arts, a Partner Agency of the national Endowment for the Arts, and a consortium made up of Arts Horizons and Young Audiences New Jersey. The finished children’s books will be on display at the Caldwell Public Library in March 2012. “Be the change you wish to see in the world” School Mosaic Mural Makeover! David Brearley Middle School is housed on the second floor of David Brearley High School located in Kenilworth, NJ. Although they have their very own mascot, the middle school lacks identity. The Art Teacher, Janice Marsili decided to write an AIE grant to energize the Middle School 2nd floor with personality and distinction. “The whole idea was to create an identity for the middle school,” Marsili explained to Leslie Murray of the Cranford Chronicle. Thanks to Ms. Marsili’s efforts – the grant funded an artist in residence from Arts Horizons, Julie Deery, middle school and high school students, and David Brearley teachers created a 68′ long mosaic mural to be the new face of the Middle School. The mural is “an artistic interpretation of the journey from childhood to young adulthood that student’s take as they move through the middle school,” said Murray. Using a strategic artistic approach, the David Brearley community transformed what was just an upper level floor in a high school to an identity space of beautiful art. Using crash glass, tiles, fired ceramic and paint, an idea was bought to life. The project’s theme was based on Mahatma Gandhi quote, “Be the change you want to see in the world” and is also featured in the mural. The mural and its theme is a great way to inspire the students as they walk the hall each day. We at Arts Horizons would like to congratulate the mural team at David Brearley on their creativity and teamwork in the mural completion. If you would like to read more about this project and its process, please click here for an article found on NJ.com written by Leslie Murray. Karen “Queen Nur” Abdul-Malik, is a nationally renown storyteller and teaching artist. Since her start in 1993, she has performed high energy and interactive folktales and multi-cultural stories at venues from the John F. Kennedy Center in Washington, DC to the Kravis Center in Palm Beach, FL. Also, on her resume one can find a list of tours, community projects, and rescidencies she has participated in. Currently, Queen Nur is in the midst of an after school storytelling residency. 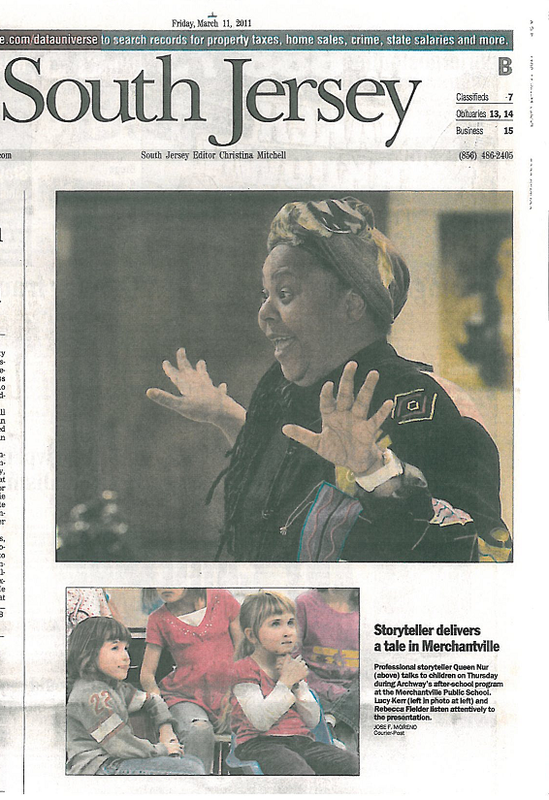 South Jersey’s Courier Post was there to capture Queen Nur in action as she presented to a group of children at a Merchantville Public School. This particular after school residency was created specifically for Archway’s Just Kids Program at The Merchantville School made possible from a grant by the Artist-in-Education Consortium. The Artist-in-Education (AIE) Program is carried out through a partnership between the New Jersey State Council on the Arts, a Partner Agency of the National Endowment for the Arts, and a consortium made up of Arts Horizons and Young Audiences New Jersey. This program provides New Jersey schools with long-term artist residences. The program is made possible through state appropriations to the New Jersey State Council on the Arts as well as funding from the National Endowment for the Arts and the Geraldine R. Dodge Foundation.